quiet, flat really, until this game. Really gutsy from Murray who faces three set points after a couple of errors. He then produces a second serve ace and then another to force deuce. But Federer fights back to gain advantage and the pair go on another long rally - 21 shots - before Murray comes to the net to force the point. Brilliant stuff! We're up to the sixth deuce now, with this game past 10 minutes! WOW! That game is finally over after nearly a quarter of an hour - unbelievable from Murray who faces six set points and seven or eight deuces (I lost count!) to finally hold his serve. He needed that big time, going two sets down to an in-form Roger Federer could have been the end. As long as the previous game was, that was a short one; Federer doesn't give up a point. Murray again serving to save the set. You've got to feel sorry for Murray, he's giving everything but Federer hasn't put a little toe wrong, yet. SET FEDERER: Oh dear, this is looking ominous now. Federer is playing some majestic tennis, I've said it before but Murray can't do anything more. It's a long, long way back for Murray now. Roger Federer's first serve could not be any better. Easily takes that game. The cheers that greeted Federer breaking confirm that this is a Centre Court crowd that, as in 2012, are divided between Federer and Murray. 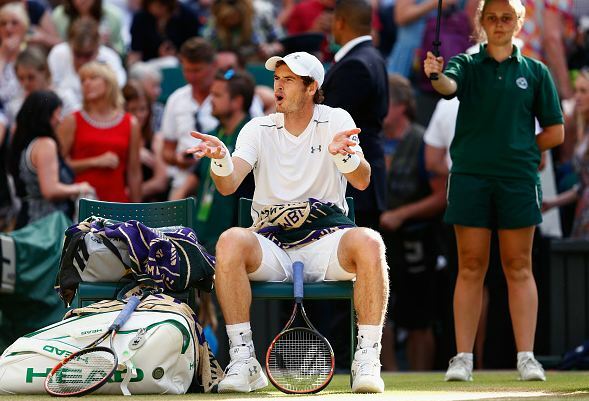 Murray may be British, but despite the softening of his public image (and to those who know him the revealing of his true personality) to many English tennis lovers he will always be a grumpy Scot. Federer, meanwhile, is immensely popular with long-time Wimbledon devotees. Interestingly, at the 2012 Olympics here the crowd were firmly behind Murray when he played Federer, as they were when he played Djokovic in the 2013 final. Murray holds his game but his service has not been the problem. He needs to find a way to break Federer or this is over. It keeps going and going and going. Federer is up at 75 per cent accuracy on his first serve and has hit twice as many aces. Murray manages to fight back to deuce but the No 2 seed quickly extinguishes any hope Murray may have had with two quick points to take the game. Quick service game from Murray and he needed that. Federer only won a point on that one. Apparently Murray has come back from two sets down to win seven times in his career - he'll need to pull a rabbit out of his tennis bag to make it eight, unless Federer drops considerably. But he doesn't look like doing that any time soon. The crowd are very quiet as Federer hits another couple of serves to take the game. There's nothing Murray can do. Murray holds again with little fuss. I feel like I'm repeating myself here. Federer holds serve without losing a point. His first serve is so good today that's he not giving the Scot any chance at all. Still up at 76 per cent on his first serve - his average for the tournament so far has been 10 per cent lower than that. No can do. Murray wins a nice point with a gorgeous lob but apart from that point Federer was always in control, coming to the net a couple more times. A frustrated Murray heads for a seat and punches himself looking for an answer. I'm not a lip-reading expert but looks like he just said: 'what am I meant to do?' to Amelie Mauresmo and Jonas Bjorkman. GAME, SET AND MATCH ROGER FEDERER! Absolutely terrific performance from the Swiss master; Murray didn't play poorly but Federer was absolutely brilliant throughout. Not a lot one can do when you face an opponent in that kind of form. That backhand return from Federer, to take a 30-0 lead on Murray's serve at 4-5, was astonishing. Murray battled back to 30-30 but Federer, in this form, is just too good. As Independent columnist Nick Bollettieri predicted, Murray needed his first serve firing because Federer ruthlessly attacked his second.